The Little Falls Arts and Crafts Fair has completed its 45th year! The two day September event is managed by the Little Falls Chamber of Commerce and is one of the largest in the Midwest, attracting an estimated 100,000 shoppers, artists, crafters, and concessionaires. It has been held the weekend after Labor Day since 1972. I recall when it began, when Dave and Carol Graf, who owned an arts and crafts store downtown on East Broadway, were two of the leaders instrumental in its formation. 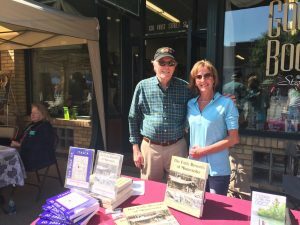 This year, I was one of eight local and regional authors invited to display and sell books along the sidewalk at the Good Book & Gift Store, next to the Great River Arts Center on First Street. My daughter, Renee (in photo), joined me in meeting the authors and the many shoppers who ventured by, or stopped at the bookstore. My thanks to Renee, and to Marge at the Good Book & Gift Store for providing the sidewalk space for displaying The Early Resorts of Minnesota and The Edge of Itasca.